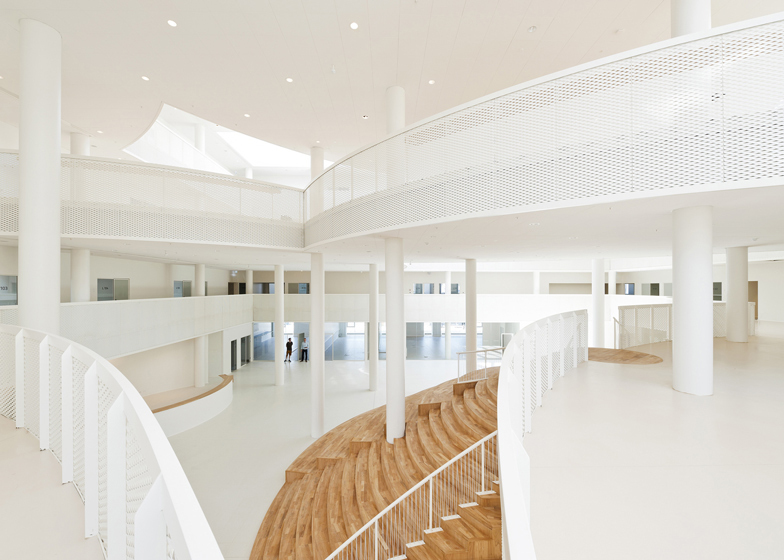 An amphitheatre-style staircase forms the heart of this adult learning centre in Denmark, which architecture studio CEBRA said was inspired by the "circles and ovals" of Disney characters like Mickey Mouse (+ slideshow). 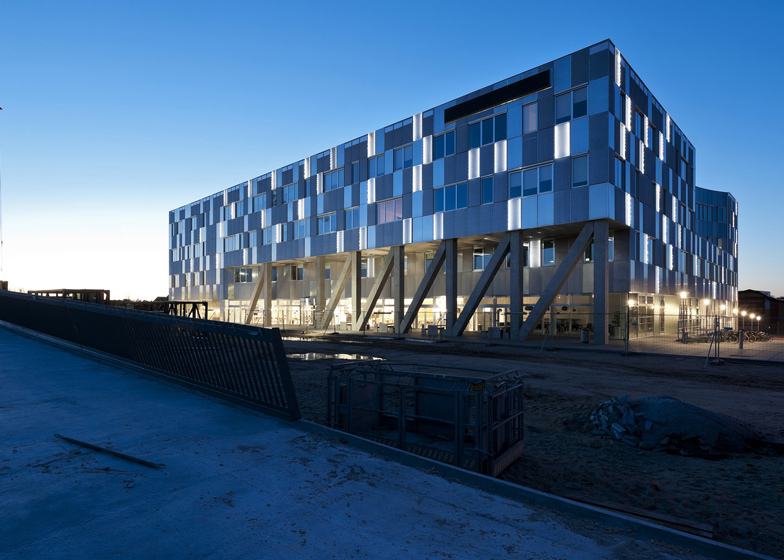 Aarhus-based CEBRA was commissioned to build the HF & VUC Fyn education complex for 1,300 adult pupils on a plot located between the city centre and harbour in Odense, Denmark. A concept drawing for the project features a sketch of popular Disney cartoon character Mickey Mouse, whose curving lines influenced the rounded staircase and scalloped balconies that form the building's interior. In the watercolour, created by CEBRA's founding partner Mikkel Frost, a decapitated and puzzled-looking Mickey Mouse can be seen exclaiming: "What, I'm a house now?" "Disney characters in general and Mickey Mouse in particular are basically drawn from a series of circles and ovals, which get more and more refined as the drawing progresses," said CEBRA's Lars Schäfer. "In the same way, the underlying concept of the HF & VUC Fyn building operates with circular shapes, which in combination make up the distinctive spatial organisation of the interior," he told Dezeen. 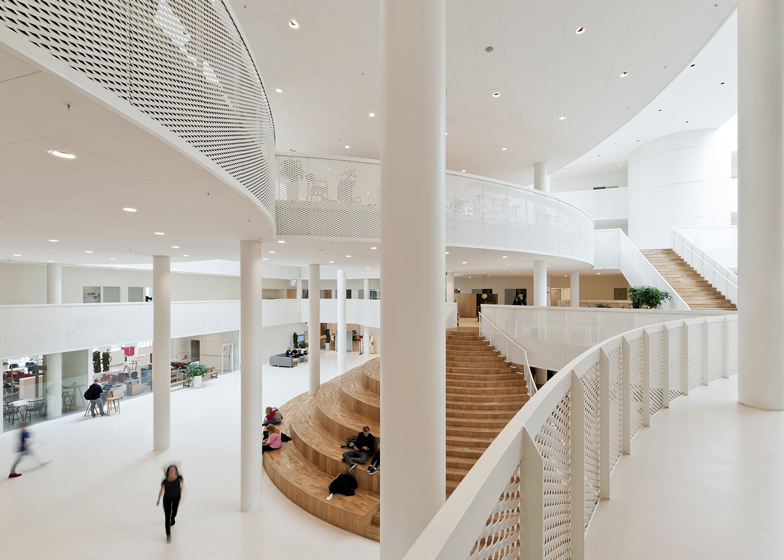 "In addition to that, Mickey Mouse can be seen as a symbol for the friendly, playful and accommodating character of the central atrium space." 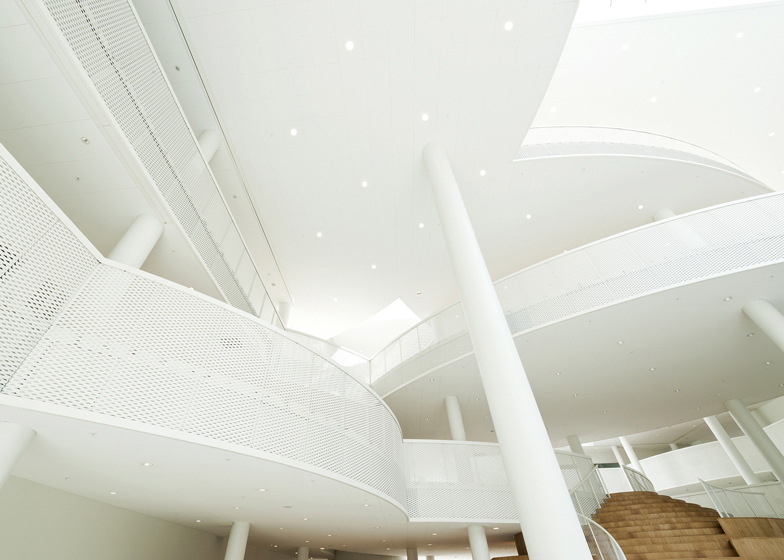 The building is arranged around the atrium – named the Agora after the public gathering spaces in ancient Greek cities. 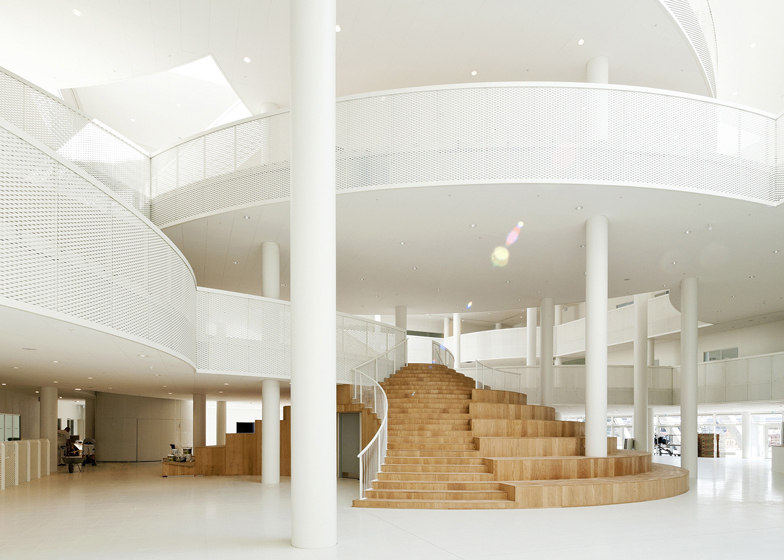 A stepped oak wood podium, called the "amphi-staircase" is set at the centre of this space. 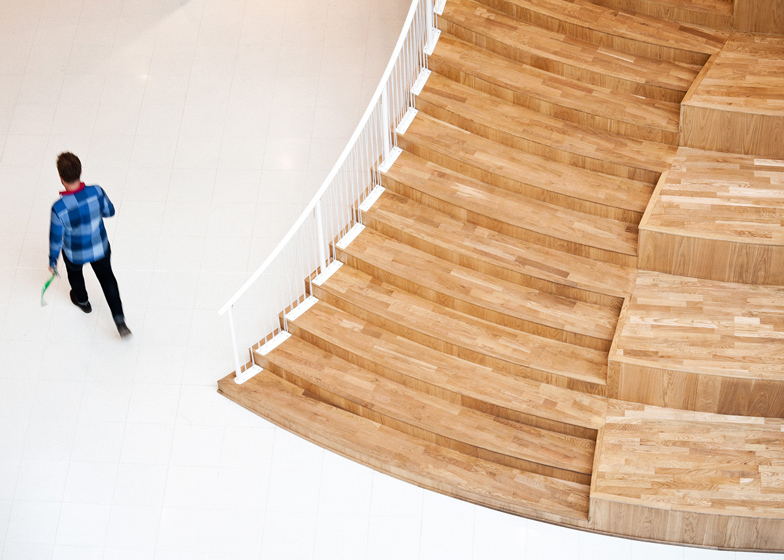 It functions as both a staircase and an informal lecture theatre – tying in with the growing trend for this type of informal seating in both workplaces and education buildings. 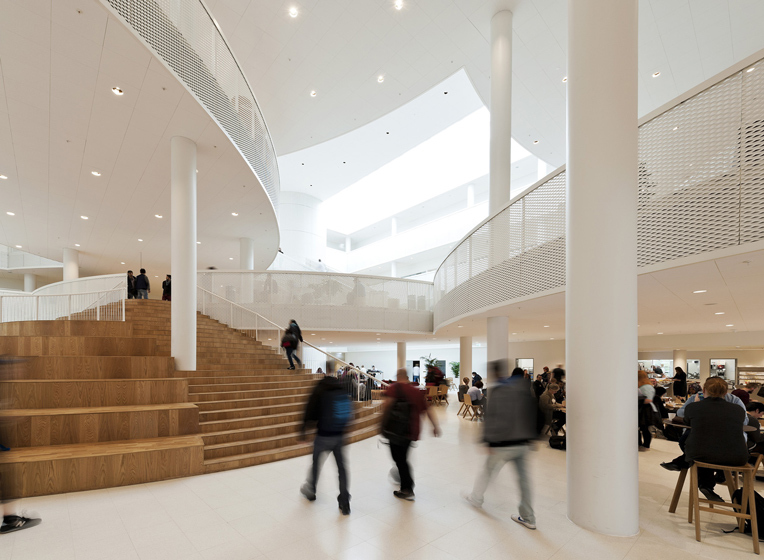 As the atrium is intended to be bustling with activity, more reflective study spaces have been placed around the outer edges and upper floors of the building. 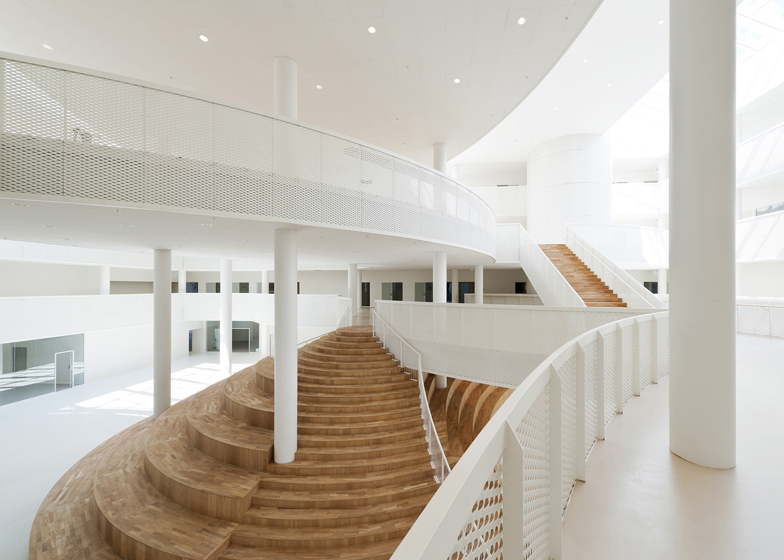 The bright white and pale timber surfaces, described by CEBRA as "a clean Nordic backdrop", offer a direct contrast to the linear form of the building's outer shell. 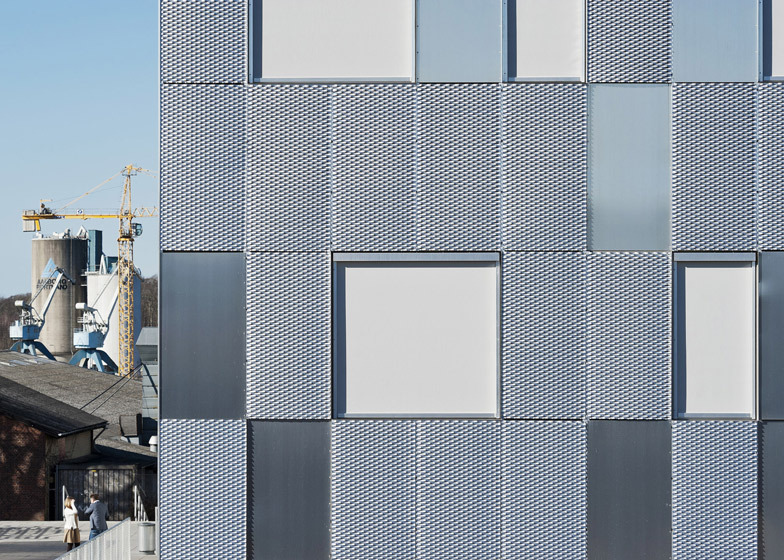 A combination of grey aluminium plates and expanded aluminium mesh cover the facades, some of which are backlit by LEDs at night. 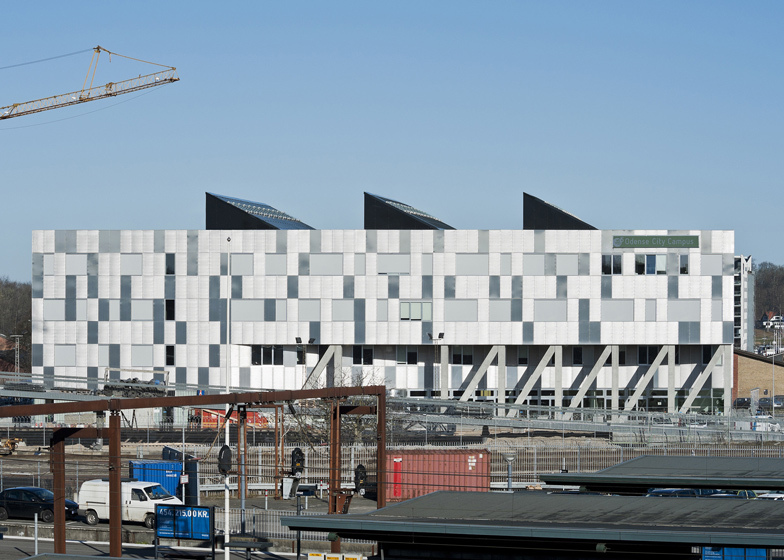 The materials and forms were selected to help integrate the building with the industrial structures of the nearby harbour. 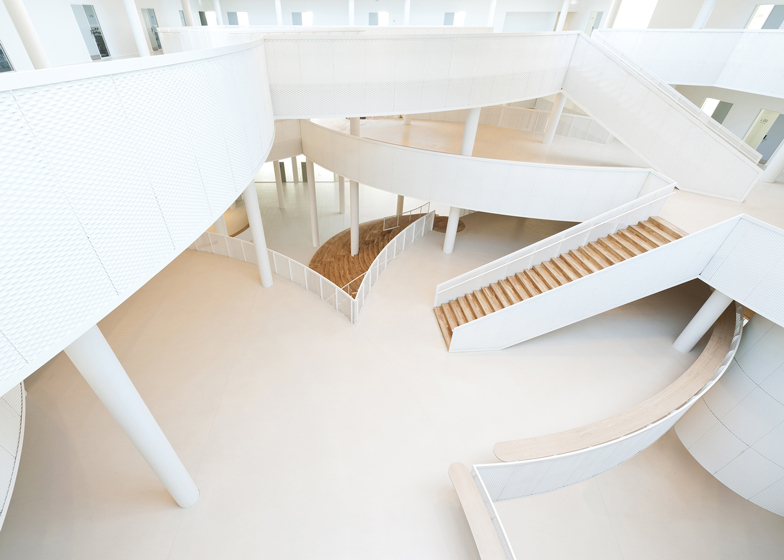 "The basic idea was to design a school that doesn't look like a school," said Schäfer. 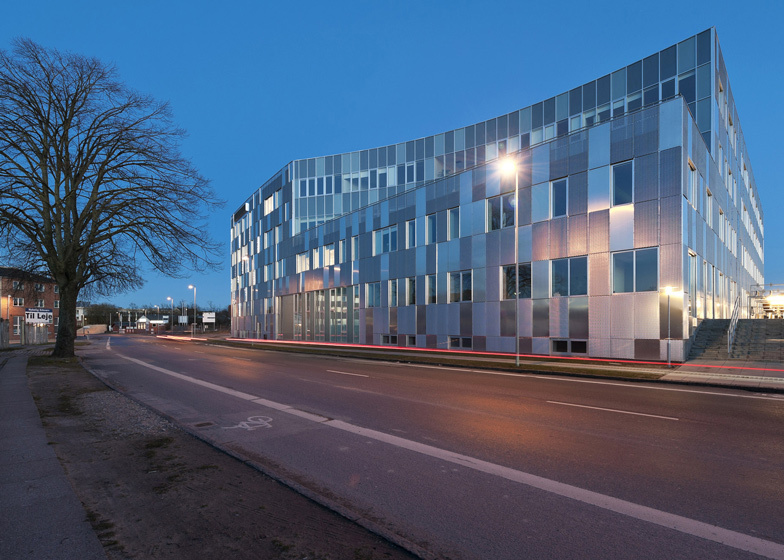 "The building's robust and unassuming exterior is contrasted by an inner spatial diversity of rounded forms." CEBRA is led by architects Mikkel Frost, Carsten Primdahl and Kolja Nielsen, who often produce imaginative illustrations to accompany their designs. Other projects by the studio include a children's home formed from a cluster of house-shaped blocks and a snowflake-shaped ski dome.